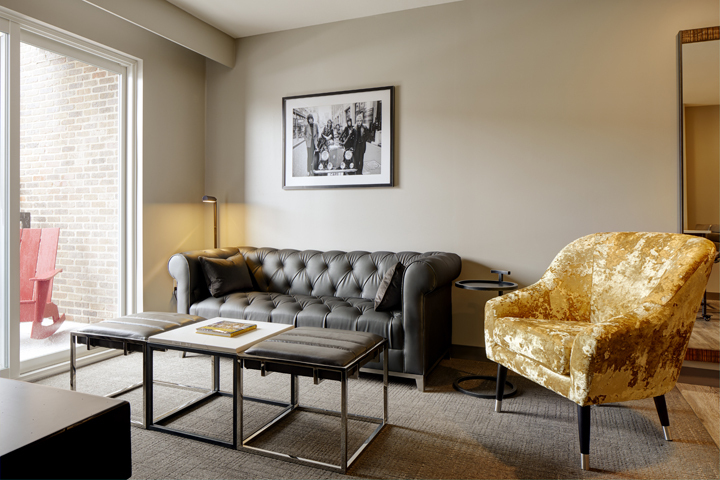 Burlington is a vibrant suburb just northwest of Boston and home to Archer Hotel Burlington — a four-story industrial-chic boutique hotel with stellar, sincere service. Consummate host Archer warmly invites you and your friends and family to stay with us while you’re in the area. 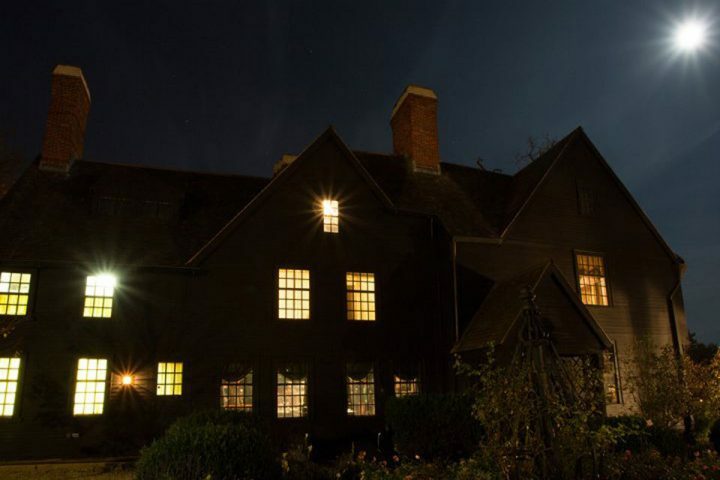 What’s Archer Hotel Burlington all about? We’d love to share it with you. While each aspect of a hotel’s service and amenities is important, we think a positive room experience is vital to our guests’ ultimate satisfaction. That’s why Archer ensures a five-star sleep experience throughout the hotel. 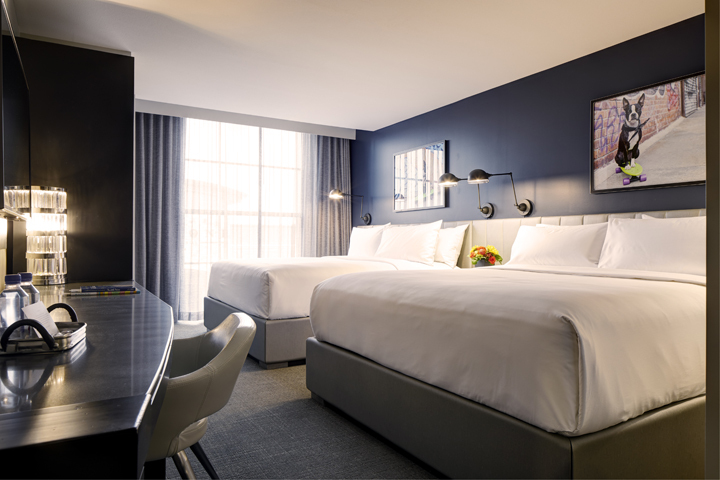 Every room comes complete with five-star bedding, which includes a plush Eurotop mattress, premium linens that feel oh, so good and a down duvet that provides just the right amount of heat (no matter the season). A selection of firm and soft down pillows means a great night’s sleep is ready and waiting; hypoallergenic pillows are also available by request. Visit a good friend’s house and chances are high that the guest room isn’t an exact copy of any other bedroom. Archer’s guests are treated to similarly wonderful but visually different rooms and suites via four design palettes, bringing an element of surprise to each stay. 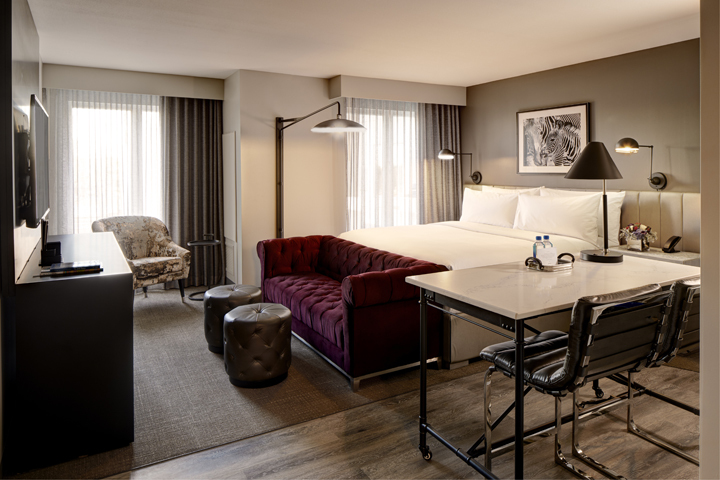 Like the rest of the hotel, the rooms and suites have an industrial-chic vibe with impressions of the Northeast. Thoughtful touches make the room experience even more memorable. Starting with a welcome treat and followed by daily turndown treats that are made in-house or curated from local artisans, each sweet treat comes with a fun note. The complimentary Nespresso® coffee experience is a guest favorite, as are the Malin+Goetz® bath amenities that smell heavenly. Notepads include words of wisdom from famous folks from the area. And the most Instagram-worthy photo? 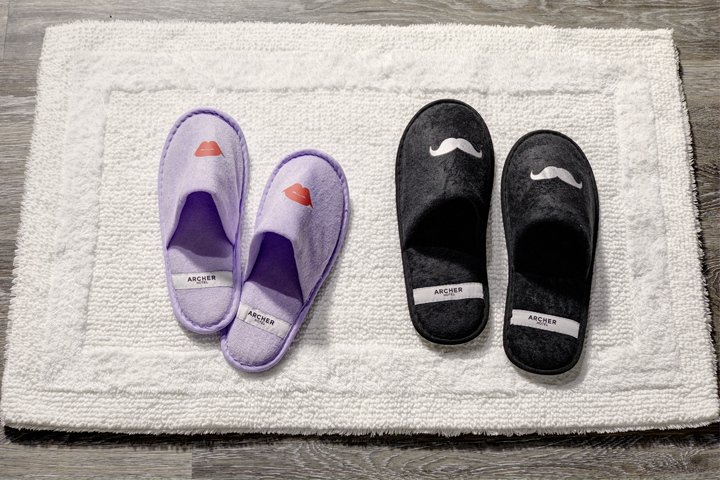 The whimsical bath slippers — they’re fun, convenient and our guests’ to keep. Archer’s art collection brings the East Coast in-house. The work of local artists and regional subjects grace the walls throughout the hotel; a sampling includes New England sports icons in the fitness center, The Boston & Maine #3713 train mural in the dining room and Aerosmith’s Steven Tyler and Joe Perry in Archer’s Den. Morning and evening, guests enjoy beautiful yet simple foods with global influences. 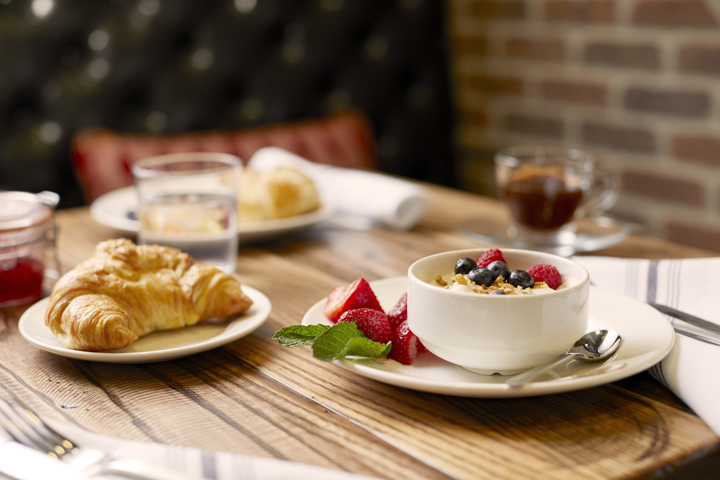 Along with Intelligentsia® coffee, Kilogram tea and several juices, a house-made breakfast buffet gives guests delicious fuel to start their day. A rotating selection of eggs is prepared with protein and potato options, and fresh fruits, yogurts, granola, Scottish oats, smoked salmon and charcuterie plus cheeses round out the morning menu. Evening bites, bowls and grilled favorites are served a la carte either bar-side or in-room. Soft pretzels served with warm brie and whole-grain mustard add a gourmet twist, while stuffed sweety drop peppers and sesame ahi tataki bites are unexpected delights. Garden bowls, grilled items and flatbreads fill the menu — several of which are gluten-free, vegetarian or vegan. The Healthy Bowl mixes field greens and red quinoa with broccoli, avocado, tomato, sunflower seeds and house vinaigrette. Or choose a Red or White Flatbread, Flat Iron Steak Sandwich or Straight Up Burger. And yes, there are a few tasty desserts for our sweet-tooth guests. The lively bar is a great place to unwind after a day of meetings or being out and about in the Greater Boston area. Archer’s mixologists serve up classic cocktails, wines and bubbles, beers, and Intelligentsia coffee and espresso. 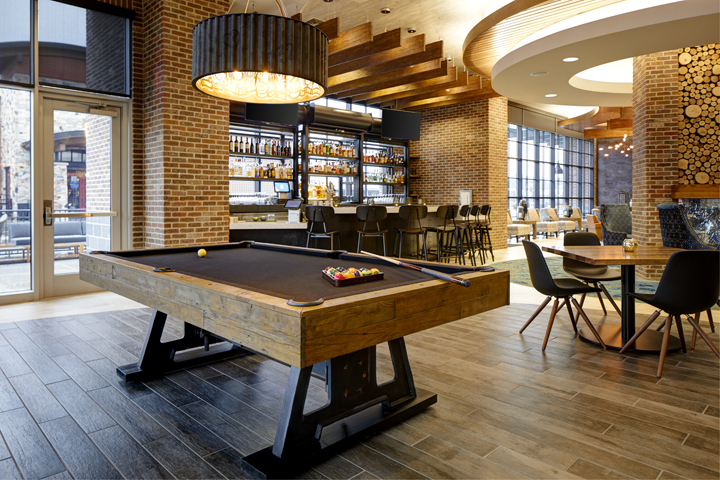 While there, guests can meet friends, old and new, around the industrial-styled billiards table — a fun way to knock back a few! Whether our guests are staying with us because of work or play, they will no doubt have some time to themselves. 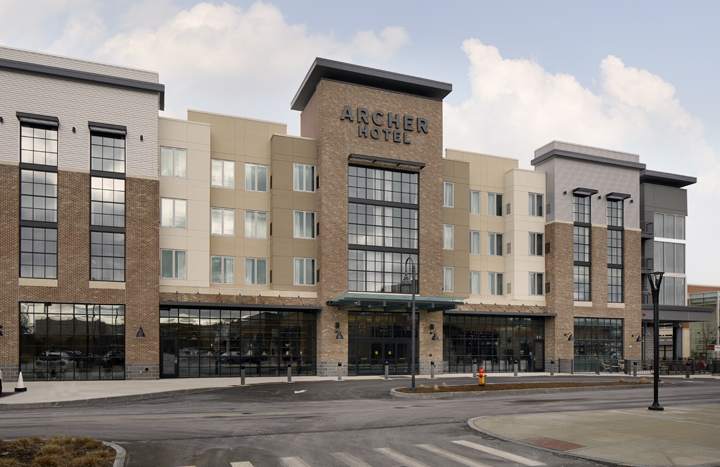 While some will cozy up in their comfy rooms and other will naturally gravitate to Archer’s Kitchen + Bar, the hotel has other options to consider. Archer’s well-appointed fitness studio has world-class Matrix Fitness cardio equipment to get the heart pumping and the blood flowing — treadmills, ellipticals and cycles — plus a Matrix AURA 300 Functional Trainer and premium free weights. An Isawall® training wall provides a terrific workout for yoga, Pilates, stretching and suspension weight enthusiasts. Forgot your water? No worries; chilled water is complimentary, as are towels and disposable headphones. Archer’s pool is a fun way for families to expend energy (or that of the kiddos). 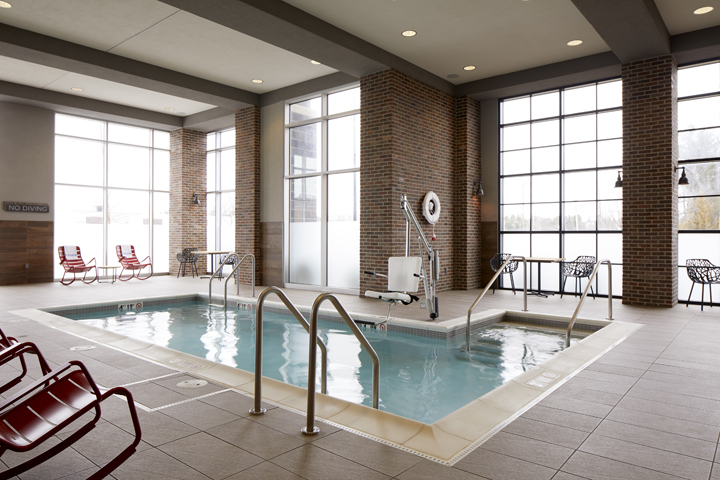 Some guests like to find their Zen in the pool, too, by floating and letting the cares of the day wash away. Archer loves hosting! 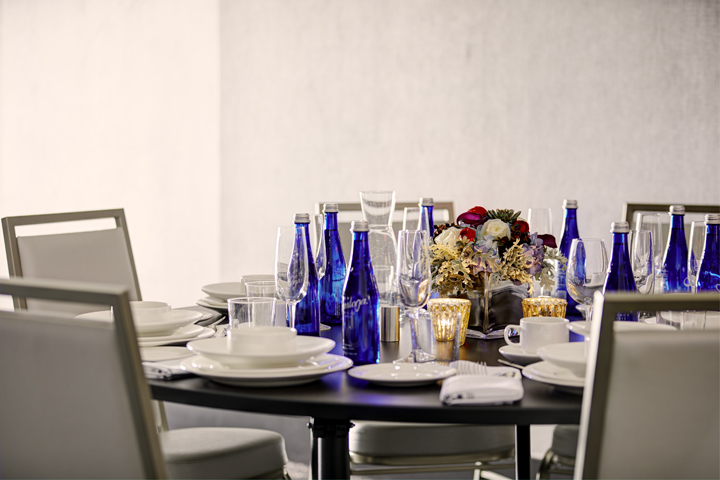 Meetings, social events, bridal luncheons, cocktail parties and intimate receptions — you name it. Archer is the host with the most, taking care of the details so that our guests can participate in the event just as much as their guests do. With luxe accommodations in an inviting neighborhood, plus diverse buffet menus, it’s no wonder our elegant venues (both indoors and out) offer some of the most memorable celebrations and functions around. Twelve miles northwest of Boston is the thriving suburb of Burlington. 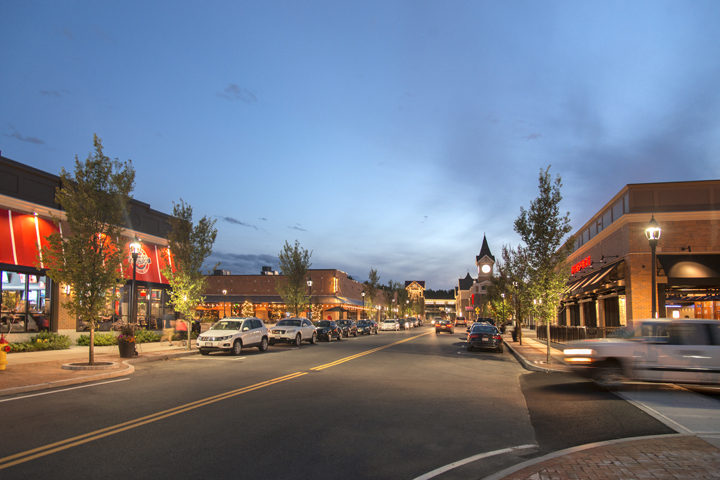 There’s plenty of shopping to be had, including the urban retail and dining go-to district 3rd Ave, in Burlington’s innovation hub, Northwest Park. 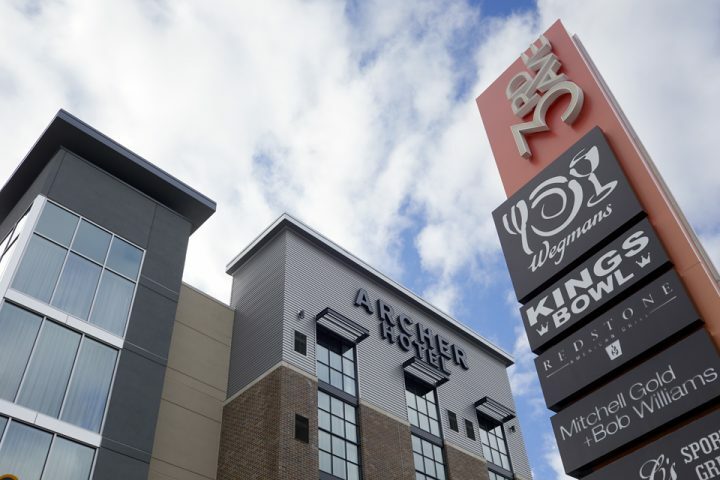 Archer is in the heart of 3rd Ave, which is also anchored by the region’s only Wegmans — ranked as America’s No. 1 specialty foods store. Along with such notable shopping opportunities as Jenny Boston Boutique, David’s Tea, Xfinity, and Mitchell Gold + Bob Williams, visitors can break a sweat at tend Barre or get pampered at LunchBoxWax or James Joseph Salon. And dining? Yes, indeed. Delicious options in a range of atmospheres abound, including The Bancroft, Osteria Nino, Redstone American Grill and Tony C’s. Family entertainment at King’s includes bowling, billiards, shuffleboard, air hockey and foosball, as well as a variety of tasty eats and drinks. For even more shopping-till-dropping, Burlington has Wayside Commons, with L.L. Bean, Eileen Fisher, Loft, Not Your Average Joe’s and The Capital Grille. The Burlington Mall has Lord & Taylor, Apple Computer, Aveda, Macy’s, Michael Kors, Athleta and Cheesecake Factory, to name a few. Archer is just east of Burlington’s Landlocked Forest — a 250-acre oasis with 13 miles of trails for runners, hikers, bicyclists, cross-country skiers, dog watchers and bird watchers. The forest has been maintained with new boardwalks and trails; it’s a green haven that’s a great escape right at the junction of the Northwest Expressway and Yankee Division Highway (I-95). 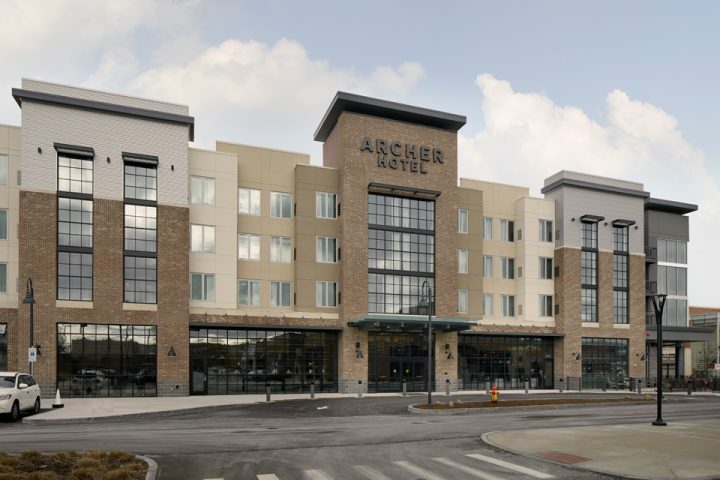 Now that you know about Archer Hotel Burlington, why not learn a bit more about this booming suburb that Archer calls home? 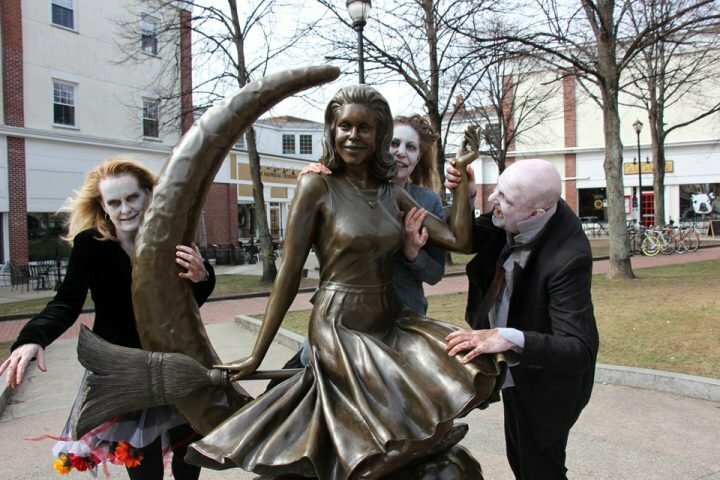 Five Facts About Burlington, MA presents additional insight into this lovely town. 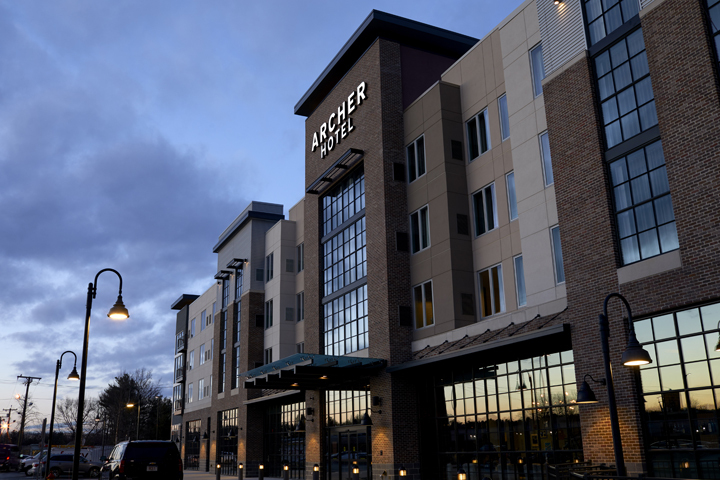 Then plan a visit and a stay at Archer Hotel to explore the area firsthand.